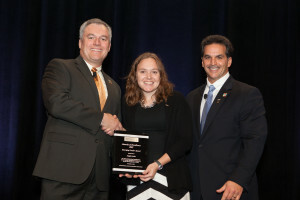 Congratulations to FEA employee, Dr Angela Lewis, PE, LEED AP, selected by the International Facility Management Association and the Awards of Excellence Team as the winner of the 2012 Emerging Leader Award. She was recognized at the Awards of Excellence banquet on Friday, November 2nd at World Workplace in San Antonio, TX. FEA looks forward to Angela continuing to share practices and innovations to promote excellence in the facility management profession.